One of my goals for 2014 is to post to my blog every Monday and Thursday. I have been dealing with a migraine since Friday evening, so you can consider this an act of sheer will or foolishness. If you read and judge this post, just keep in mind that I suffer chronic migraines and this is not a good day. I have suffered headaches since childhood. My first “real” migraine (visual disturbance, vomiting, photophobic, hell-on-earth) hit when I was 15. I thought I was going to die. I had never experienced such all-consuming pain. For better or for worse, none of my family members were familiar with migraine. They heard “headache,” gave me a Tylenol, and told me to stop complaining. We all know better now. 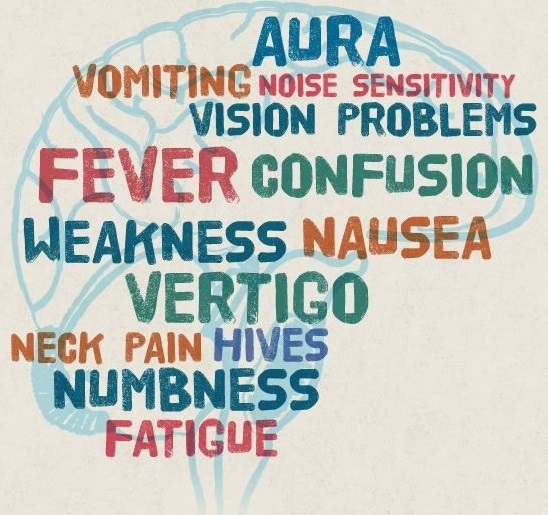 A migraine is not just a “bad headache.” I found a graphic that lists the symptoms of a migraine brain. (This isn’t my creation, but I couldn’t find who to credit.) Each migraineur–the official title of one who lives with chronic migraines–experiences migraines differently. The symptoms can include one, some, or all of those listed, and can vary not only between migraineurs, but between episodes. Sometimes I get a warning, sometimes I get slammed upside the head. Sometimes medicine helps, sometimes the medicine makes me even sicker. Sometimes the episode is triggered by lights, food, weather, loud noise, or odors, and sometimes I have no clue what caused it. Watching someone you care about suffer is its own form of suffering. It is only natural to try and find something that will ease the pain. What many people don’t realize is that migraineurs and their family members have been on a quest to find relief for a long time. I have seen so many doctors– neurologists and pain management physicians who specialize in migraine, physical therapists, occupational therapists, and psychologists. They help me manage this problem, but there is no cure. We research every possible medication, supplement, and diet; many I would be embarrassed to confess that I seriously considered. I appreciate that your great-uncle, twice removed has a neighbor who made a miraculous recovery by drinking potion-X, but unfortunately I’ve either already tried it without success, I’m allergic to it, due to other medical concerns it’s contraindicated, or as is often the case that miracle cure is an urban myth. I try hard to remember that people who call me, all excited that they found a potential cure, are doing so because they care about me. Some days it’s harder than others to remember that. It’s also difficult to deal with the pain, nausea, light and sound sensitivity, and try to be polite to unknowing but well-meaning people. Come to find out, I’m not the only one who has this challenge. Migraine.com posted a list of “12 Things you should never, ever say to a Chronic Migraineur” along with the reasons why. This list includes many of the things people say, out of the goodness of their hearts, that make me want to inflict bodily harm. One way creative migraineurs cope with their situation is through visual art. If you google “migraine art,” you will find some amazing work. Some is humorous, although often sarcastic and dark. Many artists depict the world they see through the visual auras and disturbances, and you will notice that not every migraineur sees the same optical illusions. Other artists choose to illustrate how they feel during a migraine. Many of these images are scary and painful to look at, but then again since the experience is scary and painful I would say the artist has done a brilliant job capturing it. “Migraine Art #068” perfectly represents how I feel today. I’m sorry I couldn’t figure out how to post the picture here. This drawing is from the new book, Migraine Art, by Klaus Podoll and Derek Robinson. One final suggestion for those of you who either are trying to explain what it’s like to live with an invisible disability, or for those who are trying to understand loved-ones with invisible disabilities like Migraine, Lupus, MS, and the list goes on… please take a moment to read or watch the video about spoons. I think this is the best analogy I have ever seen. Spoon Theory essay or YouTube video by Christine Miserandino. Looking forward to healthier and happier days, and a cure for migraines!